We became fans of this author with The One, and with Her Last Move, John Marrs has provided yet another gripping and thrilling read! We nearly hyperventilated whilst holding our breaths, eager to reach the conclusion in this jaw-dropping story! This author knows how to capture his readers’ imagination, he knows how to entertain his readers and he certainly has a knack for keeping us on the edge of our seats! When we’re in the mood for suspense we know John Marrs will deliver! 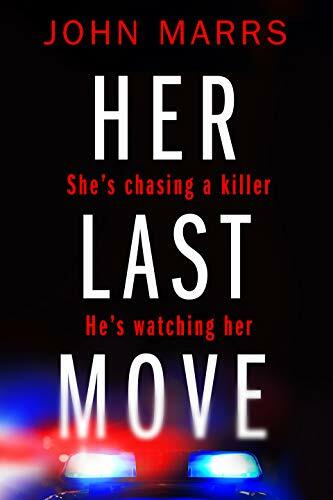 Her Last Move is an impressive, well-paced suspenseful story with a sinister undertone, complex and emotional characters brought together with spectacular writing that took us on an adrenaline-fuelled hunt against the clock for a serial killer hell-bent on revenge in the most gruesome of ways. This killer holds no remorse by enacting horrifying revenge on his victims. But why? What was his motive for these shocking murders and what was the common denominator between his victims? Well, the answer lies between the pages of John Marrs latest novel, and as the twists, turns and gripping race to catch the killer ensued, we were rendered immobile, unable to move until we reached the end! Two murders within hours of each other sets off a desperate hunt for a cruel and sadistic killer, against an oppressive London heatwave, John Marrs tells Her Last Move in three POV’s. We get inside the thoughts and reasoning of the killer, we learn the inner turmoil and sacrifices of DS Becca Vincent and DS Joe Russell, a ‘super recogniser’ with the police. Joe is able to recognise a face from countless CCTV and until now, his department is a maligned area of the police force. An anomaly to some, an unknown source to others. Joe is brought into the search in the hope his specialty can help them identify the killer. As more brutal murder occurs, a link between the victims becomes crucial, and so begins a game of cat and mouse, as piece by piece we learn the killer’s motives along with the detectives, in what was compulsive reading! Every chapter felt like a pulse-raising cliff-hanger, each character peeled through layers of themselves and their pasts, we learn so much about the characters, their turmoil and inner conflict. Both Joe and Becca are struggling with demons, guilt and the demands of family and the job. Each has their secrets, each has their pain. Each has to make sacrifices.